Strolling through the historic lanes of Ahmedabad! Mandatory registration closes after 25 entries. After the online registration, do inform through a text message or an email, before the walk, if you are unable to attend, ideally at least a day prior to the walk. 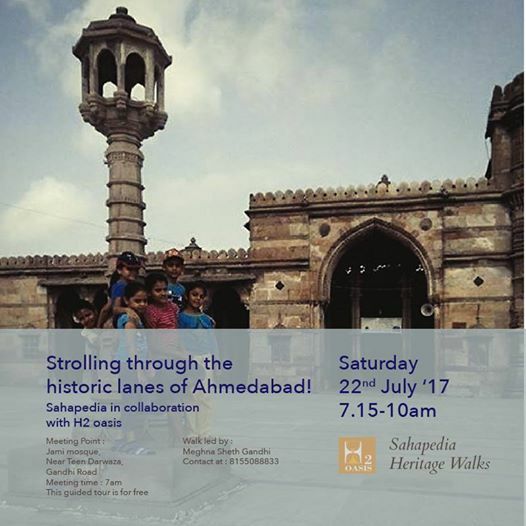 2017-07-22 07:15:00 2017-07-22 10:00:00 Asia/Kolkata Strolling through the historic lanes of Ahmedabad! Chaalo Amdavadio, this heritage walk in the Zaveri Wad area of Ahmedabad starts with a visit to the exquisite Jami Masjid, built in the Indo-Sarasenic style of architecture. Next, enter the maze of narrow streets to explore the indigenous architecture of the ‘pols of Ahmedabad’. Also get to know about ancient town planning, the logical ways of building construction and drainage systems, the scientific approach to managing natural resources, which represents the socio-cultural, ethical and sustainable values of the people who occupied it. Walk with us to experience the old-world charm of India’s first UNESCO World Heritage City. • Parking space available near the Jami mosque. • Photography allowed at most places. • Children above +9 years are also welcome provided they are accompanied by an adult. • Avoid wearing black clothes or shorts; the garment should cover the knees. • Wear comfortable footwear; avoid leather wear; slip-ons recommended.